Nearly 40-years into his career John Carpenter comes out with The Ward his first feature film since Ghosts of Mars back in 2001. In-between the two films he directed Cigarette Burns & Pro-Life for the Masters of Horror, but now Carpenter returns to feature films and going into the movie I was a bit concerned. In general most filmmakers don’t make the transition from one era to another and while I’ve seen every Carpenter film with the exception of his TV movie Elvis, I haven’t hated any of his films there were some I liked more than others, but none I disliked. The 90s his films did lack compared to those of the 70s and 80s, but they were still enjoyable even if they weren’t classics. Don’t go into The Ward expecting anything like Halloween or the Fog; if you take the movie for what it is, you might find yourself enjoying the movie even if it does have its problems. The screenplay by Michael & Shawn Rasmussen was kind of weak as the plot is rather thin and plays out more like a slasher flick; the reason behind the haunting isn’t explained until an hour in and it almost seems as if it was added in as an afterthought. The characters weren’t very developed at all as we really don’t know much about them at all however they are entertaining and that’s the saving grace to the script. Despite these problems I wouldn’t say The Ward was poorly written, but it just doesn’t have a real structure and like I said plays out like the run of the mill slasher flick with a killer and its victims. My biggest gripe is the twist at the end, which I cannot get into since I don’t wanna spoil the movie, but it’s really a major letdown and I just hate twists for the sake of it and this really had me letdown. After nearly a decade John Carpenter returns to some mixed results; the pacing of the film is actually fairly good despite the lack of plot. Carpenter does manage to make something out of nothing and seeing as the movie is only about 88-minutes it doesn’t take long for the action to kick in. There are some slight pacing problems at times, but that has more to do with the weak story than Carpenter’s direction, but Carpenter doesn’t fully take advantage of his setting either. Like the script playing out like a slasher film, Carpenter’s direction is very slasher movie like filled with jump scares and while it’s a letdown to see Carpenter go down that road it’s still mostly effective. Horror filmmakers are the ones that seem to lose it the most from one generation to the next, but John Carpenter shows he’s still more than capable of making a solid movie. Like I said don’t go in expecting anything as suspense and tension filled as Halloween, but for a filmmaker nearly 40-years into his career The Ward turns out far better than I could have ever expected. Carpenter does provide some decent suspense and perhaps a decent scare or two and while, he does rely more on jump scares everything is staged well enough to make this a fun ride. The Ward isn’t gonna go down as one of Carpenter’s best films, but again I thought it was a fun movie even if nothing memorable. 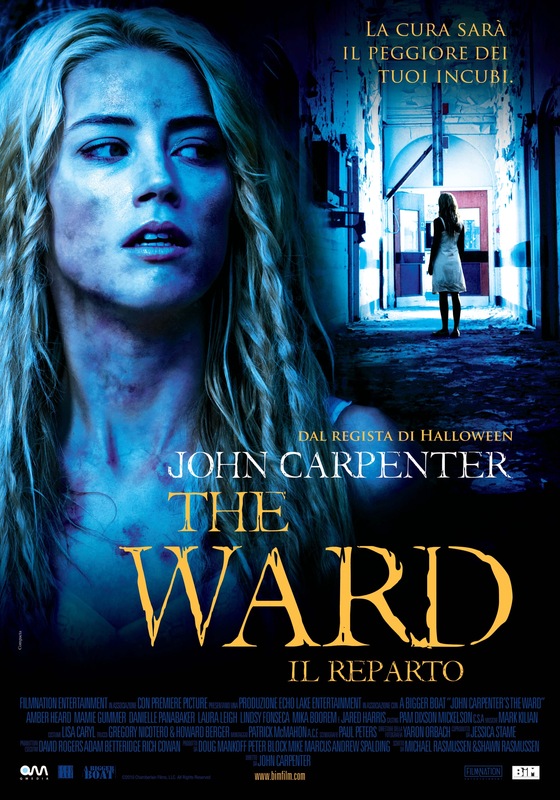 Overall The Ward may isn’t gonna be remembered as one of Carpenter’s best films and odds are will draw more negative reactions than positive and I guess when it’s John Carpenter the bar is set high, which isn’t really fair. Like I I said don’t expect another Halloween, but a film by a filmmaker nearly 40-years into his career and with that said results really aren’t as bad as they could have been. Despite the sub-par script the characters are fun and even if Carpenter’s setups are a bit cliched they still work well and thus make this an entertaining movie despite the flaws. The performances are strong and I just loved Danielle Panabaker and the score by Mark Kilian was pretty good, but it would have been better if Carpenter composed the music, but it still works well. In closing just don’t expect vintage Carpenter and you might find yourself surprised.